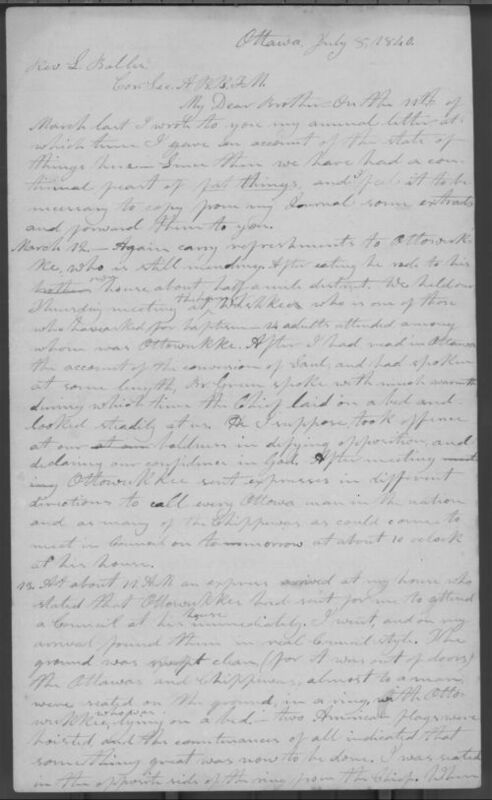 In this fascinating letter, Jotham Meeker updated Reverend Lucius Bolles (of the Baptist Board of Foreign Missions) on his missionary efforts among the Ottawa Indians in Kansas Territory. Meeker included excerpts from his journal to describe the turmoil among the Ottawa over Indian conversions to Christianity. On March 13, 1840, Meeker and his fellow missionary David Green, attended a council of the Ottawa and Chippewa that had been called to protest their missionary work. The Ottawa and Chippewa chiefs were concerned about the breakdown of their tribal society, customs, etc... and placed the blame squarely on the missionary's shoulders. The Ottawa Mission was located near present-day Ottawa, Kansas. This source demonstrates missionaries' efforts at cultural assimilation, the disappearance of native customs, and the Ottawa and Chippewa chiefs' resistance to mission work. Most importantly, this illustrates that natives' perspective on removal and their new homes in Indian Territory. This could be paired with Meeker's letter from March 11, 1840, which has also been selected for this standard. While the whole letter has been included on this website, only pp. 1-4 are necessary for use in the classroom.